Looking to Rest & Relax? Or is it more your style to Party & Play! Take your pick... or do a bit of both! A scenic 40-minute drive to Crater Lake park, this picturesque and magical mountain retreat offers the best of both worlds, and you'll be most comfortable snoozing in the hammock or well-equipped laughing it up with friends. Now with new Zip Line Adventure nearby! Enjoy scenic beautiful snow-capped mountains from the charming front porch setting, play the most picturesque golf course of your life, take in Shakespeare and Blues Festivals or Concerts on the Green, there's wine tasting, bike riding, and so much more... all from the comfort of this Magnificent Mountain Home. While you stay in this beautiful custom single-story home overlooking the 8th fairway, planked in cedar ceilings with rock and tile fireplace, you'll enjoy the serenity and privacy of amenity-filled luxury. Enjoy large flat-screen TV's and DVD and WiFi throughout the home, custom and tasteful furnishings and fully-equipped rooms, kitchen, dining areas and grounds. Sip your favorite beverage on the front balcony while watching deer amble by and golfers chipping onto the eighth green. Or 'go outback' - to the over-sized redwood deck! BBQ, relax and enjoy the warm evenings from this fully-equipped, forested back yard setting or take in the snowy wintertime landscape. In the heart of Outdoorsman's country and just around the corner from scenic Crater Lake is the golf and resort haven called Running Y Ranch Resort- Just Named #1 in 'Top 10 Southern Oregon Attractions'! Come spoil yourself. It's quite possibly the finest fun-filled Family Vacation Spot and it's ready for your family and friends. Just a short walk or ride through the Arnold Palmer-designed course, (recently ranked among the Top 100 Public Courses in America (Golf Digest) and #13 among the Top 100 Courses in the Nation for Women (Golf for Women), past the clubhouse and driving range, you'll find the award-winning SPA and activity center with indoor swimming pool and sauna, complete workout fitness center and sport courts - tennis, basketball, volleyball, children's playground and game room. Even an 18-hole putting course. The kids love this place! Be a Cowboy for a day or take Riding Lessons. (Check with the Running Y Travel Center for local area trips). Fish at nearby lakes and rivers in the morning and play a 'round of golf in the afternoon then relax at the lodge or the on-site restaurant. Take a stroll over miles of available meandering walking and jogging trails or just sit by the lakes' edge and enjoy the sights and sounds of Klamath Lake. Pelicans abound here! The Running Y is a full-service resort community situated in the heart of the breathtaking beauty of Southern Oregon’s Cascade Mountain range, just across the California border near Klamath Falls, Oregon. The Running Y’s exceptionally mild climate and 300 days of sunshine add up to a four-season recreational paradise. Plus there's a never ending calendar of fun, family events: Wine Tastings, 'Evenings in the Village' music, cars shows, food and more, Friday night BBQs, Saturday S'mores, Summer Concerts on the green, Kruise of Klamath Sock Hop, Moonlight Canoe Trips and much more! GOLF * SPA & SALON * ICE SKATING ARENA * EQUESTRIAN/ HORSEBACK RIDING * SPORTS/FITNESS * WATERSPORTS * BIRDWATCHING * FISHING * ATV'ing * WALKING * TRAILS * ALPINE LAKES * And a Sweet Little Hammock! There's so much to do for those on the go. And it's just the perfect setting when you just want to relax and unwind. Call today to Enjoy your stay. Our family grew up fishing and boating in the lakes and rivers around Sonoma and Napa Counties, California and we love the mountains. Ever since we sold our publishing business, we've tried to find the perfect place to take our grown kids and their families to spend time with them. With our very first visit to the Running Y Ranch, there was no question we had to make this our go-to destination. We found a home large enough to accommodate the kids and scooped it up. It's heavenly to sit on the front porch or back deck and let the mountain air just penetrate and soothe your soul. The abundant wildlife and picturesque mountain and trees shows you God is in the details. It's an amazing place to stay active too. We golf, ATV, horse back ride, hike, bike ride, fish... and on it goes. We hope you'll find the peaceful tranquility of our home as well as all the amazing activities to suit your preferences the same way our family does. Come anytime for a visit! Enjoy. Sharon & Mike. Our favorite golf course is the Arnold Palmer-designed links at the Running Y Ranch. It's challenging enough for the skilled golfer, but 'playable' enough with generous fairways and greens for when we want to work on our game or just enjoy a fun, social round. The course is ranked in the top 100 nationwide and you'll hear me describe it this way, 'Every hole is a picture postcard. It's so amazingly beautiful'. Bordering the golf course is Klamath Lake! We've been boating, fishing and hiking here. Tip: Bring your camera... there's tons to take pictures of and create a photo library of your vacation! World Class Lakes and Rivers... From one of the worlds most picturesque lakes, Crater Lake to one of the most family-friendly, fun-filled spots, Lake of the Woods, the Klamath Falls Running Y Ranch playground is amazing. Everywhere you look there are rivers just ripe with trophy-size fish and rafting and boating opportunities around every corner. Come on, jump in... The water's great! Plus in Wintertime, the Ice Skating Arena is open. It's magical to be there with family just having fun skating and sipping hot chocolate. Think those romance movies you've seen... it's really quite special. Great house to stay at! Great location. Great house for our family of 4 . Love having a garage to park in when it is raining and snowing. Love all the deer around the house all the time. A very comfortable and we’ll appointed home. Home is in a wonderful setting. Quiet and calm neighborhood with roaming deer and brilliant fall colors. We were fortunate to have stunning weather. Home is cozy with everything needed; kitchen has all the necessities and then some. Property owner was incredibly helpful, communicates well, and obviously cares for the home. The house is in a beautiful quiet resort community. The house is cozy, comfortable, fully stocked and was perfect for our family of 5. Our kids loved the foosball table! The resort area is a drive from off-resort resturaunts and gas stations, so stock up on groceries before you go. There is a resort market which is minimally stocked with food, well stocked with beer/wine, mostly gourmet and a little $$. We visited crater lake- it was about 1h20min drive door to door. Would highly recommend this home. Wish we could have stayed longer. Serene escape to relax and also have some fun!! Overall this was a great property!! Away from the hustle and bustle. Pretty much everything you needed could be found at the market. The home was really nice, The foosball table was a hit!! Crater Lake itself was more like an hour and a half away, the entrance is 40ish minutes. Just FYI. The owner Mike, was wonderful!! I would definitely stay here again!! Very comfortable and included everything we needed. We had 5 adults and 2 5 year olds. The sleeping arrangement was perfect. The hide-a- bed was not very comfortable for our son, so he used the inflatable bed instead. Worked out just fine. We loved hearing and seeing a variety birds, watching the deer come through each day. The granddaughters loved the swimming pool and play area. Nice that the "Ranch" provided towels at the swim center. The house was very clean, had everything needed to make the stay comfortable. Loved the "moose" theme. Proximity to Crater Lake, Lake of the Woods, and Lava Beds Nat'l Monument was great. Excellent place to stay. Now Introducing Crater Lake Zip Line! Oregon's Longest Zipline. 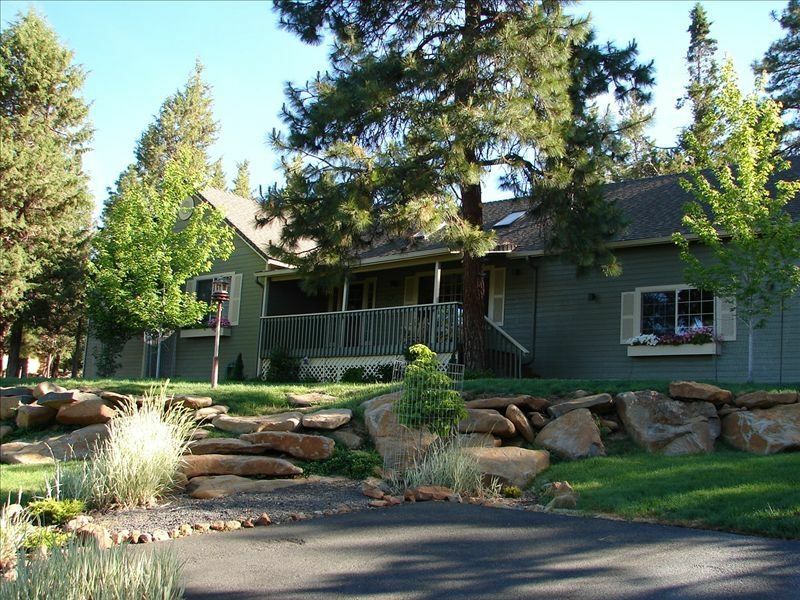 Just minutes from the home, with magnificent views of Upper Klamath Lake, Cascade peaks like Mt. McLoughlin and Pelican Butte, and the rim of Crater Lake. It makes you feel like you can see forever. Oh, the beauty! Oh, the thrill! Soak in the views from our ALL tree-based platforms and zing down the hillside on 9 ziplines covering a mile and a half of cable! We offer our alternative payment options - directly through us and with credit/debit card or PayPal - to save you money! Email the owners directly!